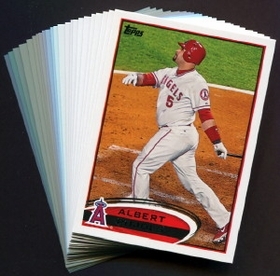 The 2012 Topps Los Angeles Angels of Anaheim MLB Team Set contains 23 Los Angeles Angels of Anaheim baseball cards including Star Players like Albert Pujols, Mike Trout, Jered Weaver, Bobby Abreu and Mark Trumbo. The baseball card collecting hobby has always been well suited to the baseball fan and collecting baseball cards of your favorite MLB baseball team. It's fun way for you to keep track of your teams players and show off your home team pride all at the same time. Topps Baseball cards have been collected longer than any other brand on the market today and card collecting is a great family activity that can last a lifetime. All cards in this team set are listed below.